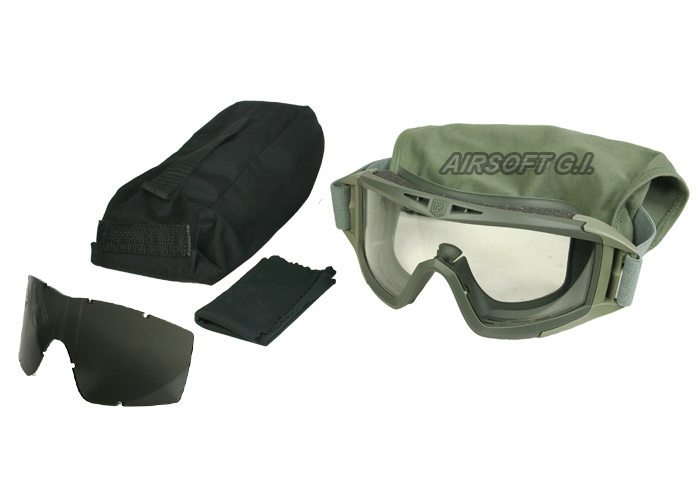 Package Includes: Smoke Lens, Clear Lens, a carrying case, and lens cover. These goggles are very worth the purchase. They are made of high quality materials designed for comfort and reliability. When i go airsofting, I use smoke lens that block out the sun and are very good against the sunlight. It has UV protection as well. I loved the design and it fits me well. The goggles are made of rubber covering and the nose protector fits well. The bag is convenient for travel as well as the 2 different type of lenses. The lens are crafted so that it could even withheld real shotgun blasts. It fits well on most Americans. The adjustable strap is comfortable and is made of a stretchy material. I love the lenses. I shot them over and over, they just cant break. The lens cloth makes sure that your lenses will not have any scratches. I believe that these goggles are sometimes somewhat not for the fir of Asian people. If you are an Asian descent, I would recommend you to purchase the Asian fit ( which is designed specifically for the Asian face shape). the clear lenses sometimes fog up if you are in extreme condition. AMAZING GOGGLES!!! These things are so great, i love everything about them. They don't want to fog unless the goggles are very cold. But they made a thermal lens for that. If they fog on you all you have to do is remove a little foam. These look so cool in my opinion and i love to wear them. The only thing that inconvenienced me was that the Bravo Strike Steel Half-Face Mesh Mask (http://www.airsoftgi.com/advanced_search_result.php?keywords=Bravo+Strike+Steel+Half-Face+Mesh+Mask&inc_subcat=1&categories_id=&x=61&y=12&inc_subcat=1) Doesn't fit very well with the goggles, so i just cut it to the right shape with a pair of tin snips! does this have a fan? no, this does not come with a fan.